What Ombre Style is Best for You? Ring in Spring With a Hot New Hair Hue That's Perfect For You! Want to gear up for warmer weather with a gorgeous ombre mane, but are unsure where to start? 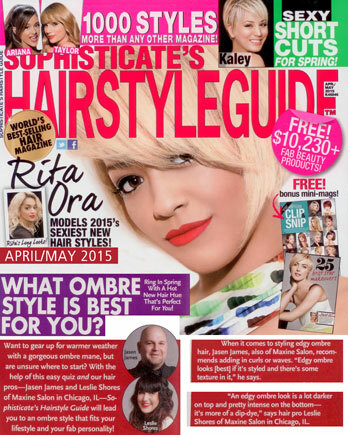 With the help of this easy quiz and our hair pros - Jasen James of Maxine Salon in Chicago, IL - Sophisticate's Hairstyle Guide will lead you to an ombre style that fits your lifestyle and your fab personality! For each question, circle the answer that most closely resembles you. A The life of the party! A Attending the gottest social event. You love to mingle and be seen! 4. From mane maintenance to crafting gorgeous styles, how many hours a week do you spend on your hair? A 8-10 hours. You love giving your tresses all the time and energy they need. B 4-6 hours (or less!). You're easy-going about your mane and enjoy minimal styling and maintenance. C 6-8 hours. You give your strands attention - most days! A Any outfit you'd like - no matter how bold! There are no limits or restrictions. B Neutral colors and professional (but still chic!) pantsuits with minimal accessories. C Business modern ensembles - from fab skinny pants to gorgeous blouses - that you spice up with a pop of color or statement jewelry. A Kylie Jenner - she dares to be different and never shies away from trendsetting hair and beauty looks! B Lily Aldridge - her beauty vibe is subtle and understaed, but completely stunning! C Rachel Bilson - she's an effortless beatuy with sytle to match! A Gravitate toward fun, funky styles that make heads turn. B Keep it simple with a sleek ponytail or straight lengths tucked behind the ears. C Are known for your signature style - long, beachy waives that fall from a center part. What Ombre Style is Best for You? Tally up the number of your A, B and C responses. You're a true trendsetter who loves trying out the latest mane moves and hair hues! An edgy ombre style will not only match your firery personality, it will also help you stand out from the crowd. "An edgy ombre look is a lot darker on the top and pretty intense on the bottom- it's more of a dip-dye," says hair pro colorist of Maxine Salon in Chicago, IL. From platinum blonde to teal to green to purple, the color choices for edgy ombre are endless! (Think: Kylie Jenner, Khloe Kardashiean). When choosing this style, be aware that maintenance comes along with it. "Funky colors tend to fade pretty quickly, so you have to come in and get it freshened up at least once a month," explains Shores. When it comes to styling edgy ombre hair, Jasen James, also of Maxine Salon, recommends adding in curls or waves. "Edgy ombre looks [best] if it's styled and the's some texture in it," he syas. Shores also warns to make sure this hair move is a good fit for your career - as some employers are more particular about bold tress shades. You're a natural beauty who is a little more carefree about your beauty vibe, but you still love to look - and feel - stylish! "Subtle ombre is more classic, natural and conservative," shares Shores. James describes subtle ombre as "soft ribbons of color with tonal differences on the ends" (think: Lily Aldridge, Olivia Palermo, Suki Waterhouse) and recommends it for ladies who don't have the time (or energy!) for frequent color touch-ups. "It's great [for women] who want to invest in their hair and their look, but don't want to have a lot of maintenance," he says. James also shares that subtle ombre doesn't need to be touched up for three to six months-or sometimes even longer! Subtle ombre may not be extremely trendsetting, but it is classic. "Subtle ombre isn't going to go out of style," says James. not only is subtle ombre a universal hair hue that's both laid-back and sophisticated, it's perfect for ladies of any age! "Anyone can wear classic ombre," says Shores. "It [fits] any age [group] and any type of career." You're a stylista who mixes trendsetting styles with effortless glam. You like to spice up your beauty look with a few bold accents here and there, while still keeping it chic. "The classic ombre style is definitely a little more bold than subtle ombre," says Shores. "It's darker on top and lighter at the ends; it's more of a grown-out look at the root and the colors are a little bit brighter." (Think: Sarah Jessica Parker, Selena Gomez, Gisele Bundchen). James adds that this hair hue is a good fit for just about any lenght - from a grown-out bob to longer, shaggier locks. Fabulous for any stylish sister, classic ombre is low maintenance and typically work-friendly. "You might come in [for a touchup] every three to four months," says Shores. Classic ombre tresses can be styled in a variety of ways, but if you're going for a laid-back, beachy vibe, try wrapping strands around a medium barrel curling iron to create headturning waves.